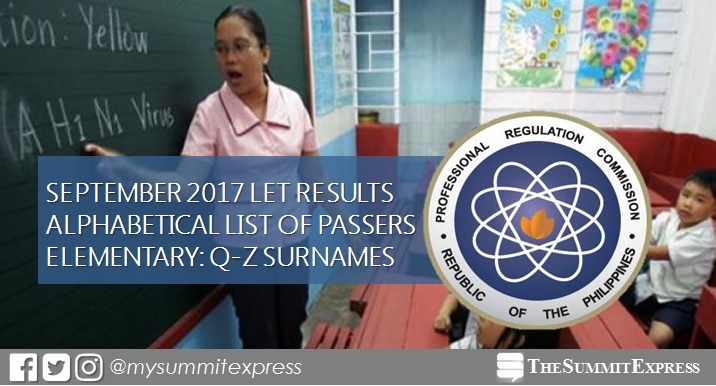 Those awaiting results of September 2017 Licensure Examination for Teachers (LET) may check on this page the alphabetical list of passers (Q-Z surnames) as the Professional Regulation Commission (PRC) and the Board of Professional Teacher (BPT) released results on Monday, November 27. The teacher licensure exam was administered by BPT composed of Dr. Rosita L. Navarro, Chairman; Dr. Paz I. Lucido, Vice Chairman; Dr. Paraluman R. Giron and Dr. Nora M. Uy, Members, on September 24, 2017 in at least 27 testing centers nationwide and 2 abroad for the Special Professional Licensure Examination (SPLE). Takers may view on this page the alphabetical roll of passers for Q to Z Surnames.